As the world largest betting exchange, Betfair has revolutionised the way in which we bet. Not only does the bookmaker allow us to back results, in the same way you would a traditional bookmaker, but it also allows you to lay bets, essentially becoming your own bookmaker. You may or may not be aware that they recently underwent a massive merger with that of Paddy Power, another one of the bigger bookies in the industry. The merger has actually changed very little in terms of how Betfair works, so from a punters perspective it means very little, but still worth noting. The bookmaker has now become one of the most flexible in the industry and allows you to really dig deep with your betting strategy as a result. With football playing a huge roll at Betfair, it’s likely there are going to be few better bookies to work with. They’ve always been really good at offering great odds and have been recognised by industry awards for this exact reason. One thing that we want to really focus on today is how the traditional sportsbook performs, over say the exchange. You see, with the exchange you can back or lay at any price you want. There might not always be the money to get the price you want, but you are able to sit tight and wait it out. This technically means that, as long as you can find some liquidity with the price you want, you can always get the best price. The sportsbook is going to be where a lot of you are betting, so it’s here that we will concentrate. On average, we found their pricing structure to be very reasonable. To give you an idea of the results we found, we looked at the upcoming round of Premier League matches that were on offer. Just by chance we click on games between West Ham and Stoke, Brighton and Tottenham, then Bournemouth v Man United. As you can see, for at least one bet of all three markets they were either best price or tied for best price. In this case it was for Stoke to win, Brighton to win and Man United to win. We realise that this isn’t exactly the most scientific of tests and sample size is very low, but we thought it likely wasn’t coincidence that we happened to pick these three games at random and saw them at the top for some of the bets. As we dug a little deeper we seldom fond them to be far from best price with pretty much all games to be honest. Whilst they seemed to have Premier League games covered in terms of pricing, we then moved to look at lower league matches, from the likes of the Championship, League 1 and League 2. The first game we looked at was that of Birmingham v Sheffield United and again, they were on their own best price for a Sheffield United win and just behind for the draw and Birmingham win, respectively. There were actually plenty more examples of these types of bets within the Championship and even the lower league games. We’re pretty sure you’re getting where we are coming from with this though, so won’t include any more examples. What we will say is that they brilliantly consistent. In fact, we would have to go as far as saying that they might just be as good as we found. Again, we need to stress sample size, but the initial results are highly encouraging. The market coverage from Betfair is pretty solid, but it’s not amazing. They don’t actually list exact numbers like most bookies do, but we found that the depth was definitely down on other bookmakers that we have tested. This was for Premier League matches as well, a league you would assume is about as good as it gets for coverage. The biggest omission was that of Asian Handicap betting, a market that is flying at the minute. In fact, handicap betting on the whole was pretty poor, so if these are the types of bets you want to place, it’s likely there will be better options for you. Having said that, the main hitters are all there. The likes of the BTTS, Over/Under goals, result and BTTS, Half Time/Full Time and plenty of others. It’s a decent selection, but not one of the better ones that we have tested for sure. Unfortunately, as you move down to the lower leagues, the number of markets reduce once again. They are likely going to be good enough for most bettors, but do lack compared to the competition, which seems to be a common theme for market coverage. Outside of the UK, football coverage is very good. You’ve obviously got your big leagues from the likes of Serie A, La Liga and the Bundesliga, but it appears that you get a good range of leagues and tournaments from other countries as well. Some of the more obscure include that of Bolivia, Greek, Indonesia, Moroccan and Romanian, to name but a few. We counted around 50 different countries that were covered on site, which is a good amount, but if you compare that to a recent review we did with 10bet, they are a little short to their chart topping 65. It does need to be said that again, for the majority of users, there will be more than enough. We do want to note that there Betfair’s market coverage for these less popular leagues is much better than most. We saw only a little drop off from lower league English football to that of the likes the Australian A-League and the American MLS, which is a good return when compared to most bookies. Betfair have jumped on the bandwagon by offering a request a bet service which they have called, Odds On That. The process is very simple, all you need to need to send a tweet to Betfair (@Betfair) and then include #OddsOnThat in your tweet. They then post out your bet to their traders to see if they can accommodate you, if they can they send a direct link, so you can place it. But, it has to be said, they are always pretty accommodating it seems and put to use their range of markets to make some pretty obscure bets for people. The range of bets and the prices seem to be pretty reasonable actually and the function also allows you to bet on other people’s bets. You simply need to navigate to the #oddsonthat section, under “All Markets” within your game of choice to find them. Due to the sheer volume of bets, they are grouped within betting prices of under 9/1, 10/1 to 49/1, 50/1 to 99/1 and 100/1+. 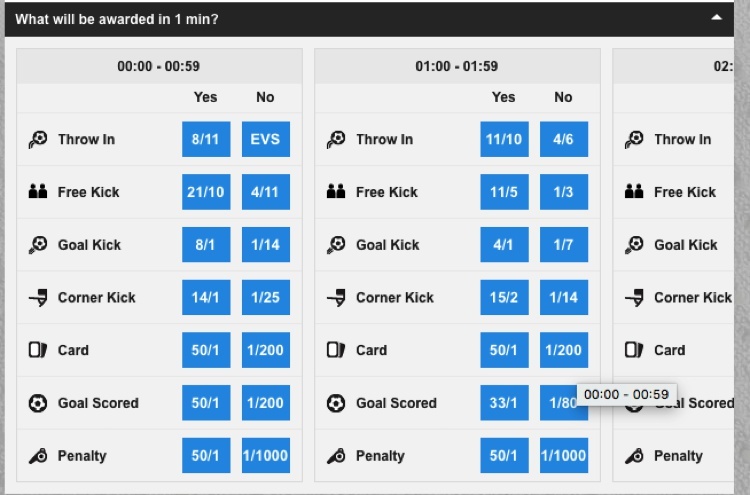 Betfair have a couple of unusual betting markets that we found quite interesting to be honest. The first one that really grabbed our attention was that of the “Quick Bet” section. Here you are able to make off the cuff bets that need to happen within a designated period of time. For example, one of the bets is called, what will be awarded in 1 min? You then choose the scenario, from things such as throw in, free kick, goal kick, etc. and then you choose the time period in which this will happen. This market is also extendable to that of 5 minutes as well. Another one is that of the man of the match betting. We don’t believe we’ve seen too many, if any other bookies offering this type of market, so it’s something that is definitely new to use. The concept is simple, you just choose which player you think will be man of the match for the game. As a twist, you also get to choose from the WhoScored.com man of the match market as well, where the winner is paid out from the sites chosen player based on ratings. We’ve found that this market is actually quite popular with the request a bet function mentioned above. 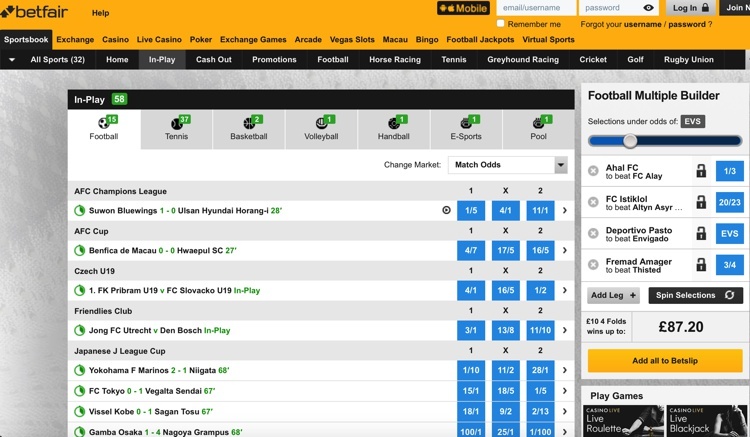 As a football bettor, we thought that you might be wanting to know about one of the latest features that’s recently been added to Betfair in the form of their Football Jackpot. It’s similar to that of the pools, but instead you bet within syndicates. Each has a set number of matches to predict from the game and then you simply choose the WDW result. You can add in as many lines as you want, which gives you more chances to win, but will increase your overall stake. Each syndicate will only start once it’s been fully funded, which in turn guarantees you a shot at the jackpot for that bet. It’s a nice feature as it’s a different change of pace from the majority of bets and has a sense of community where you can bet with other punters as well, mimicking their bets if you so choose. Cash out betting has been at Betfair for some time and it’s one of the most used features for punters. The feature works with the majority of football games that go live, but if you go to the Cash out page and then scroll down, it will give you a look at the games which will have the function working at the bottom of the screen. As part of the feature, it also offers that of partial cash out as well. This process is pretty simple in that you can choose to cash out a certain percentage of your bet for a guaranteed return, whilst leaving the rest of the bet to run. For example, say you place a bet on a team to win and the payout would be £200. They are 1-0 at half time and the cash out price is £100. You cash out for £50, leaving £50 in the pot. The remaining cash out balance has a chance to get up to £100, giving you £150 of what would have been your maximum return. 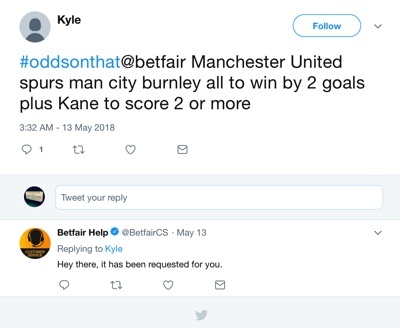 We’re not sure if Betfair were the first offer live betting, but we know that many moons ago they were certain one of the early instigators. 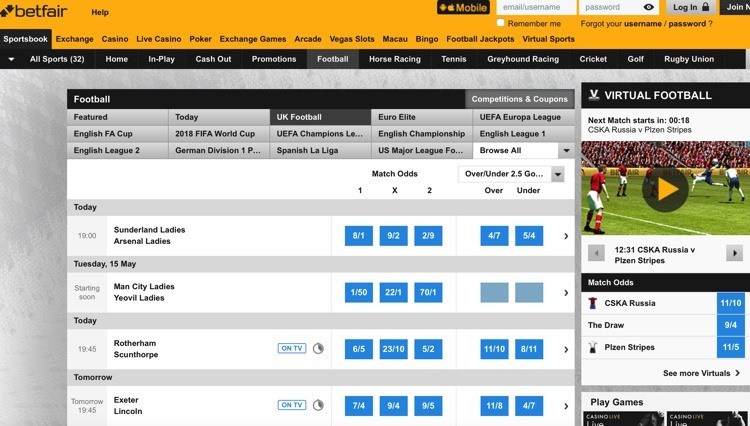 The concept of live betting took off as a result, but we still think that even though Betfair were one of the first, they’re right up there now as one of the best. The in-play betting section has always looked really good for us, which is an important part. You see, this section has a lot of moving parts, the time is updated, scores are uprated, goals are flying in and it’s generally a busy section. A poor design and it really degrades the usability. Betfair though have kept it simple and clean, which works so well. For one, they have removed seconds from the times on screen. This may seem a ridiculous thing to bring up, but it’s less moving parts and enhances that clean look we spoke about. The games are properly listed and broken up by leagues which again works nicely. We were also big fans of the fact that you can change the original betting market that is show. The list includes half time bets, BTTs, and several Over/Under goal lines. Once into the game of your choice, the markets open up a lot more. You get to see the full range and with it is a nicely designed match centre, showing the status of the game and what’s happening on the pitch. It’s not OTT, it’s pretty simple, but it works and that’s the most important thing when it comes to live betting. The stats section is one of the few downsides that we’ve found with Betfair to be honest. They’ve decided to go in-house instead of doing what the majority of bookies do and use one of the external sites for this function. This is fine if it offers good value and information, but if it lacks it makes them look a little silly. Unfortunately, it fits more into the latter than the former. Don’t get us wrong, the stats section has some functionality. You can see the top scorers for each team, recent form, past results, head to head and league positions. But that’s your lot I’m afraid. There are no statistics for betting related markets like most have, such as average over 2.5 goals or number of corners per game. It doesn’t show the whole league when comparing in the table, so can’t really work out what each team is playing for and you only see an overview of the score of the previous game. It’s also worth noting that you find the stats section within the betting markets for each game. It took us some time to find it, but it actually makes sense that it’s here as it will be used to form bets. The banking system at Betfair is pretty much no frills in that they offer what you would expect from a company of this size. The main Visa credit and debit card options are all on offer, along with e-wallets, such as Neteller, Skrill and PayPal. As one of the biggest betting sites in the world and the biggest betting exchange, the Betfair brand is one that is really tough to beat. No other bookmaker offers the flexibility that Betfair does. But, what’s most impressive is that pretty much everything they do, they do really well. The only negative that we found from our whole review came in the form of the stats section, an area that you can easily search online for to find the info out anyway. Heck, you can even use another bookie if you like! The bookmaker ties in pretty much everything that you need for betting on football. The biggest standout has to be the price for us and from our testing, found they were right there on just about every match we looked at. Are there better bookies than Betfair at the minute? Tough to say, but if there are, then they are few and far between.